Established in 2007 to honor the memory of Clayford T. Grimm, this Scholarship is awarded every year to a Master’s level graduate student who is conducting research in masonry. The investigation can be in masonry materials, structures, construction, or architecture and must be performed under the direction of a member of The Masonry Society. The current value of the annual scholarship is $1,000 US. The Masonry Society (TMS) is accepting applications for a 2019 Clayford T. Grimm, P.E. Student Scholarship until July 31, 2019. (see Rules for additional requirements for the applicants). The 2019 scholarship award will be presented during TMS’s Awards Luncheon on November 7, 2019 in Scottsdale, Arizona. The 2020 scholarship award will be presented at the 2020 Annual Meeting in Denver, Colorado. 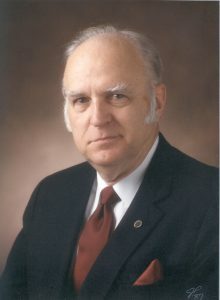 Clayford T. Grimm, or Tom, as his many friends knew him, was a licensed structural engineer and noted author and friend. Prior to his untimely death in 2003, he had authored more engineering literature on masonry than any other living American. His published works include more than 170 papers in virtually all of the national architectural and engineering journals. Mr. Grimm served as an adjunct member of the architectural engineering faculty at The University of Texas at Austin for 22 years where he taught undergraduate and graduate courses in masonry engineering and in construction specifications and contracts. As a member of TMS, Tom served in nearly every role. Besides being a founding member, he served on most TMS committees including the Board of Directors and the Technical Activities Committee. He was the first chair of the Task Group that developed TMS’s website and he greatly assisted TMS in establishing relationships with various international groups. For his contributions, he was presented the President’s Award in 1995 and was made an Honorary Member of TMS in 1997. To honor his memory, The Masonry Society created the Clayford T. Grimm, P.E. Student Scholarship in 2007. A recognized masonry expert and world traveler Mr. Grimm was internationally known throughout the masonry arena. He received the rare and treasured award of Honorary Member in the British Masonry Society of which he was a founding member. He was arguably the best known American in masonry. His longtime and dear British Colleague H.W.H. West described Tom Grimm as an international colossus, known and respected in ASTM, ASCE, ACI, TMS, Rilem, CIB, ISO, and BMS.